• I am familiar with cacao cultivation and processing practices. This knowledge gives me an understanding and appreciation for the unique flavor of each chocolate I use in my recipes and production. • I value my partnership with fine chocolate makers and chocolate manufacturers. 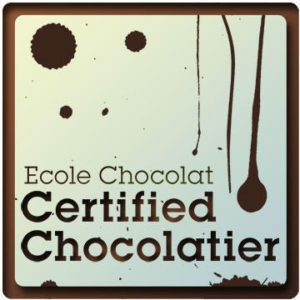 I use my knowledge of chocolate to evaluate their offerings for my preferred flavor profile, including lingering finish, bitter to sweet balance and viscosity. • I understand the chemistry of chocolate and how its chemical properties determine a chocolate’s performance when used in different techniques. I may use a specific chocolates for fillings, another for enrobing and yet another for molding. • I know how important it is to perfect my chocolate recipe development process, as pre-planning and testing is key to the success of the final product. Good recipe formulation and production best practices allow me to produce a perfect product efficiently, safely and consistently, time after time. • I have experience in professional chocolate making skills and techniques including tempering, enrobing, decorating and molding. I am knowledgeable about the equipment used to support fine artisan craftsmanship. • I respect my customers and their intelligence by being open about the ingredients and processing of my chocolate products. I keep my product labels, promotional materials and marketing messages accurate and don’t make claims that I cannot support.